The church dates back to c1130 when it probably had an axial tower. Transepts were added to this in the late C12. The restored chancel dates from c1200 and the nave is later C13, altered in the C15. There are fine C16 monuments. 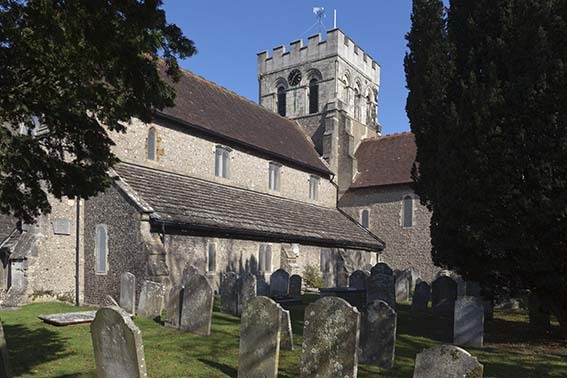 Nothing that could be part of the church mentioned in Domesday Book (13, 30) remains and the oldest parts belong to a church of c1130. W H Godfrey suggests plausibly that this had an axial-tower plan like Shipley, but slightly smaller (SAC 81 p107). Though the crossing was altered later and the weight of the tower has caused some distortion, it retains work of this period, notably the chevrons on the head of the eastern arch; its soffit is enriched with lozenges and the label with shells. 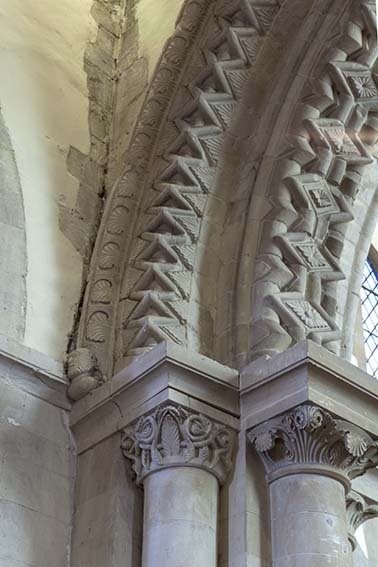 The crisp carving of the capitals has led to suggestions that they were renewed in the C19 (www.crsbi.ac.uk retrieved on 1/4/2013) and the pointed head of the more complex west arch has been rebuilt, probably in the C14, using the old stones. There are two orders of chevrons and rosettes on the soffit and the outer order has a form of beakhead. It is an early instance of the exuberant decoration found rather later at Steyning and Climping. Above this arch is the outline of what appears to be a further one, which may mark the dimensions of the original arch (EH). If it does not, its relationship with the rest is puzzling. At all events, it must be linked with the lower stage of the tower, which is probably also of c1130 and is built of flint, not ashlar as the remainder. At the time of this work, the presumed earlier nave was probably retained, but not the eastern parts. The transepts of c1170 were added before the upper stage of the tower. This is shown by the detail and in any case, it would have been hard to insert the necessary arches on the north and south sides of the crossing with the additional weight of this stage in position. The arches are pointed with three slightly chamfered orders and stops on the heads and responds. On the related ones between transepts and aisles only the responds have stops and are chamfered and despite renewal they show that aisles were intended by this date, if not already there. 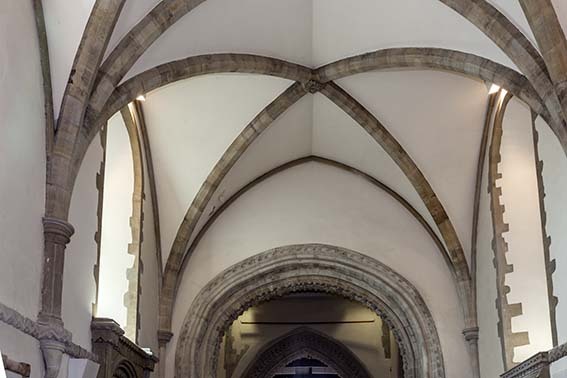 Blocked round-headed and roll-moulded openings above the transept arches may seem too large for windows, leading to the suggestion that the transepts were two-storeyed (BE p390). These exist, e g at Jumièges in Normandy, but that was a great monastic house and though large, the openings here are more likely windows of c1130 that were originally in the side-walls below the axial tower (once again, Shipley provides an idea of their likely appearance). Until 1826 each transept had three east chapels, of which the blocked openings can be seen outside, though in the south transept three C19 slightly chamfered arches opening into a vestry may replace these entrances. The transepts have no east windows, because of the chapels, and the lancets, all renewed, on the other sides are set high. That might appear corroboration for the suggestion that there were two storeys, but there is no sign of any contemporary lower windows (for example that in the south wall of the south transept is C15) and it seems unlikely that the lower level would have been entirely dark, especially in view of the chapels opening off it. In the south transept and the north gable the lancets have round heads and are certainly late C12. Openings each side probably gave access to the roofs; that in the north transept (visible inside) is shafted. The upper stage of the tower followed after at most a brief delay. It has pointed and shafted openings, linked by a string-course, which enclose plain round-headed ones, of which there are two each side except three to the south. In 1804 it had a spire and a corbel-table, shown on the Sharpe Collection drawing. The present ambitious chancel dates from around 1200, though this is obscured by many later alterations and a round-headed south doorway uncovered in 1939 was interpreted as belonging to the church as first built (3 p4). This is unlikely since there is good evidence (see below) that the present chancel is wider. Thus, the side and east lancets are C19, allegedly recreated on the basis of fragments found. The quadripartite vault has been largely rebuilt, probably re-using the ribs, as the more elaborate mouldings in the two eastern bays look old. Its design is characteristic of c1200. The shafts do not rise from the floor but from hooked corbels (a feature associated with New Shoreham) incorporated in a string-course with chevrons. Large buttresses each side of the eastern crossing arch are probably remnants of the narrower walls of the previous chancel and may have been kept to support the tower. 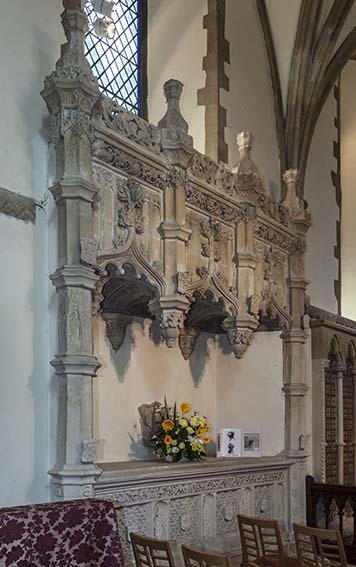 Probably also at this time, the responds of this arch were replaced, so that each now has three demi-shafts with much renewed scallop capitals, with foliage and birds. The nave dates from slightly later in the C13 and has four-bay arcades. Though altered, they have round piers, double-chamfered heads and responds with spurred bases, except for a fluted corbel on the south east one. One south lancet shows the original form of the clerestory and both aisles have west lancets, which are renewed, but probably reliably; otherwise, the windows are all later. The ground plan was not altered subsequently, but probably because the living was rich, C14 and C15 alterations were many, aside from the rebuilding of the western crossing arch, which was probably done for structural reasons. 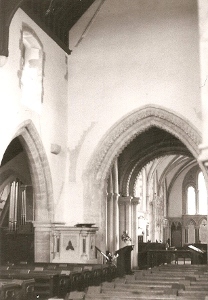 Though none survives, a photograph taken during the restoration (2 plate 5) shows that all chancel windows had been replaced in the C14 and had quatrefoil heads, whilst a second Sharpe drawing (also probably 1804) has a four-light east window of the same date, of which part of its opening can still be traced. 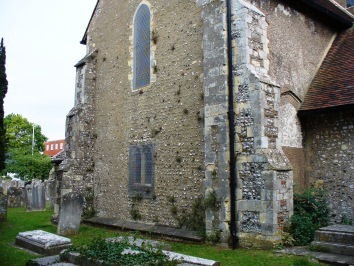 Work of c1350 at the west end included large stepped buttresses at both angles, a large west window with reticulated tracery, now renewed, and a stone porch like the present C19 one. Two south aisle windows are also of this date. Unusually, alterations in the C15 included changes to the nave-arcades, which received octagonal abaci and bases using a different stone. Harrison and Leeney’s alternative suggestion that these were changed in the C18 is unlikely (2 p101). Though the crownpost roof is mostly renewed, some old timbers are C15 also. The outline of the lower but more steeply pitched previous roof can still be seen. At the sane time, two-light clerestory windows with segmental heads replaced all but one lancet and a north east one has panelled tracery. This was probably to provide more light for the rood loft, of which the only other evidence is the corbels for the beam above it, which are over the easternmost arches of the arcades. Crosses of squared flints each side appear original. Of the C15 windows in the north aisle and elsewhere, only the south window of the transept has escaped renewal. The north porch with a moulded arch and a round opening in its west wall is also of this date. Until a west doorway was opened in the early C19, this was the only entrance to the nave (GM 1819 pt 1 pp11-12). Late C18 and early C19 drawings do not show any post-Reformation alterations, though according to a report of 1826 by C Hide when little more than a boy, the north transept was then a school (WSRO Ep I/40/5127) and the fabric was in poor repair. In that year E Hide, C Hide’s father, re-seated the church (ICBS), added north and south galleries and replaced the spire by heavy battlements of dark stone (WSRO Ep I ibid). He also added a clumsy round stair-turret, which Nibbs shows, noting in 1851 that it had been replaced by a window. Other repairs included new west windows in both aisles (ibid) and pews (2 p101). 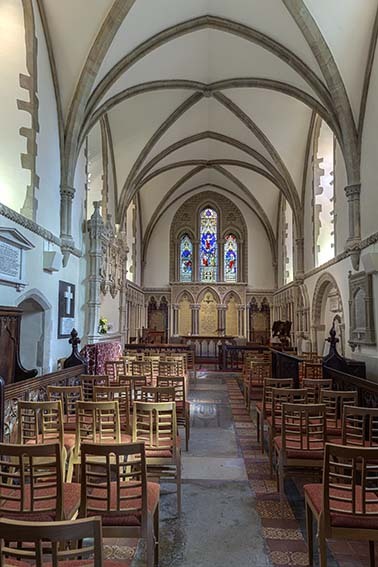 In 1855 the chancel was restored. Though G E Street had praised the C14 east window (SAC 84 (1944-45) p142), it was replaced by a poorly proportioned triplet and the vault was reconstructed as the walls were spreading under its weight (3 p8). Allegedly, plastered brick was used as in-filling in the rebuilt vault. This was criticised in an anonymous article on church restoration in Sussex in Building News in 1866 (13 p61), which ascribes the work to an unnamed local builder, again almost certainly C Hide, in view of his known work on the nave and transepts in the 1860s. According to the article, all stonework was retooled and the roofs replaced. By 1875, £4000 had been spent (PP 125), giving scope for extensive work. The statement that work on the chancel may have continued until 1866 (SAC 84 ibid), is contradicted by an account in The Builder for 1855 (B 13 p565), which indicates that it was effectively complete, so confusion with Hide’s later work on the nave and transepts (WSRO Ep I/40/5127) is likely. Following a report in 1862, he worked until a complex dispute with the church authorities started in 1866, adding a vestry and renewing much stonework. However, he did not carry out plans to replace the battlements of the tower. A plan to replace the roofs in 1870 (ibid) may not have reached fruition as the dispute with Hide was not yet settled. Information about later work is limited. In 1883 a ‘Mr Scott’, described as architect to the restoration committee (BN 44 (23 March 1883) p xxi), recommended stabilisation work to the tower, but this could be any of three or more Scotts – J O Scott, George G Scott junior or E E Scott come particularly to mind. It is not known what was done, nor who was responsible for the new west porch and the replacement of the west window, both in 1887. In his obituary in The Builder (69 p339), E P L Brock is said to have designed ‘additions’, but neither a description nor a date is given. Most recently, the battlements of the tower were rebuilt without change in 1989 (EH) and the interior was re-ordered in 2009 by Lee-Evans LLP (Architect’s website) with the altar in the crossing. 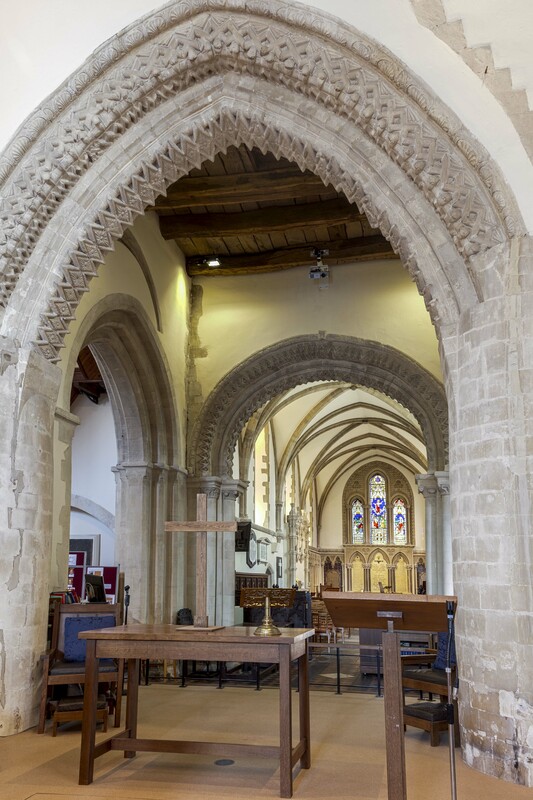 A mezzanine floor was inserted in the north transept and the seating was replaced, but the pulpit was retained. 1. (Chancel) John Mapilton (d1432) rector and chancellor to Henry IV’s queen, Joan of Navarre. It has a canopy and is good work belonging to Series D of the London workshops. The figure is wearing vestments and the engraving of the expressive face is especially fine. 3. John Corby (d1415) A brass inscription only to another rector. Though long placed together, they were not originally connected. Font: Small retooled C15 octagonal bowl with quatrefoils on the sides and an arcaded stem. 1. (East window) T Willement, 1856, for C Hide, costing £145 (Willement ledger). This is typical of Willement’s work at this time, highly pictorial and with bright colours. 2. 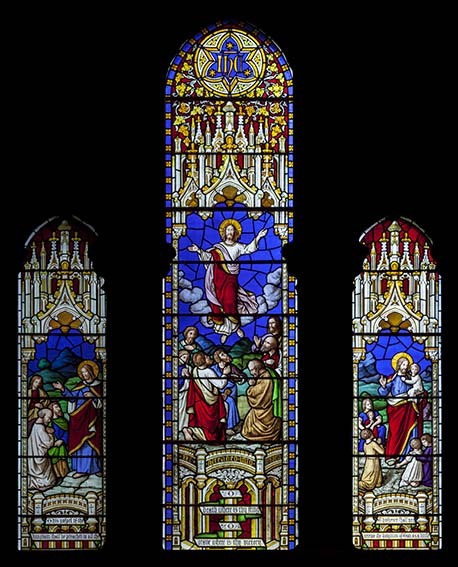 (South chancel first and north chancel windows) ‘Gibbs’ i e C A Gibbs 1856. Heraldic. (in memory of Mrs A Thwaytes) (B 14 p88). 3. (South aisle, first window) Clayton and Bell, 1883 (www.stainedglassrecords.org retrieved on 4/2/2013). 4. (South chancel) Cox and Barnard, 1953 (WSRO Fac 289). 1. (Chancel) Thomas 5th Lord de la Warr (d1524) Large three-bay canopy with ogee arches, thick finials and bottle-shaped pinnacles. There may never have been any effigies (2 p126). There is some renaissance detail, e g the cresting, but the chest and vault are still gothic. A helm which hung above it (see 1) is now in the Royal Armouries, after a controversial sale in 1974. 2. 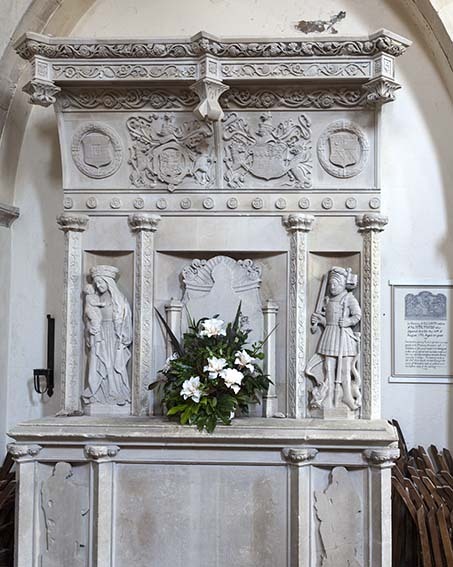 (South transept) Thomas 6th Lord de la Warr (d1554) and said originally to have been in the south aisle (3p11) His chantry is at Boxgrove, but he was buried here after the dissolution. The carving on both is similar, but is here less accomplished, though the renaissance influence is stronger. It probably predates his death. The flat, coved top has pendants and arms. The tomb, like many in the Selsey area, centred on a figure of Christ or the Trinity on the back, which has been cut back, as have the figures on the chest beneath. The side ones of the back, showing a Virgin and Child and St George, though damaged, have survived as they were concealed until they were found in 1826, when the tomb was moved here and placed against the wall (1 p82). 3. (Churchyard – east of the north transept) Widow of Peter Penfold (d1793). On the tombstone is the Last Judgement, showing the church tower breaking into two. 4. Newton Barton (1808?) by P M Vangelder (Roscoe p1309). 5. Henry and Mary Vernon by J Bedford and Sons. Henry died in 1807 but the monument dates from after the death of Mary in 1831 (ibid p89). 6. Frances Kirkby (1823?) by W Watson (ibid p1333). 7. Lieutenant-General Sir Richard Jones (d1835) and George Jones (d1844) by J Bedford and Sons (ibid). 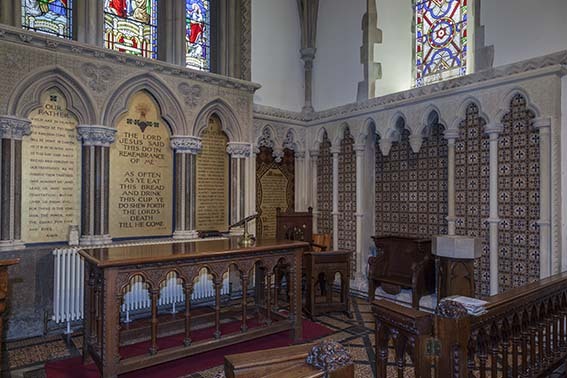 Pulpit: C19 stone with dark marble shafts by C Hide (3 p5), replacing a C17 one now at Holy Trinity, Worthing. Reredos: 1855, stated to be by the restorer of the chancel, with elaborate blank arcading with marble shafts (B 13 ibid). As befits the Evangelical leanings of Worthing at the time, the Ten Commandments are incorporated. 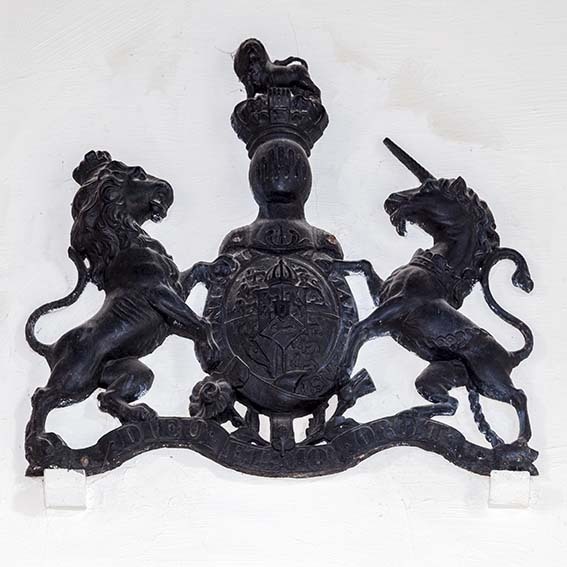 Royal Arms: (South transept) George III. unpainted iron, dating from before 1802. 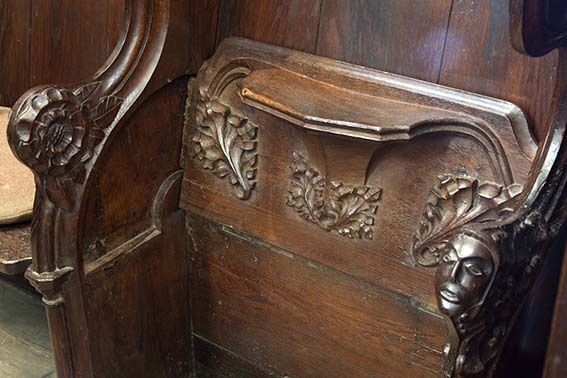 Screen and stalls: C15 wooden gates at the entry to the chancel may come from a screen, whilst six C15 misericords showing foliage and also carved heads and other fragments are incorporated in the C19 stalls. 3. 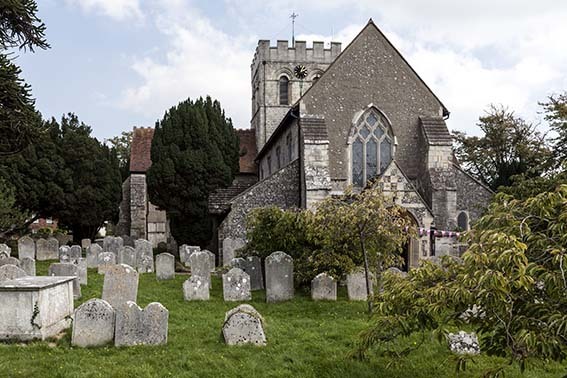 D Mayo: A Walk round Broadwater Church, (revised edition) 2014. My thanks to Richard Standing for the photograph of the south transept; the remainder in colour are by Nick Wiseman.